Upgrade the look of your bathroom vanity with a beautiful, durable, custom made vanity top. Choose from real patterned Copper, Stainless Steel, or one of the many Metallic Finishes. These non-porous antibacterial surfaces are well suited for bathroom vanity tops where durability and style is essential. Nothing can equal the brilliance that Stainless Steel or Copper can create. Their natural properties allow them to be a “designer’s neutral” absorbing and reflecting the color tones of the bathroom, working with virtually any color hues. Available in a wide variety of Metallic Finishes such as Antique Copper, Pewter, Rubbed Bronze, and more. Precision cut to any specification/size to accommodate any single or multiple bowl/basin requirements. 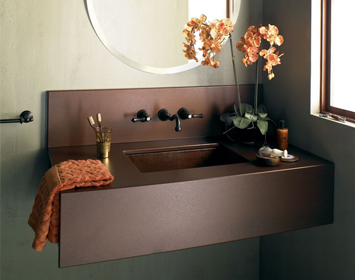 Choose a Custom Metal Vanity Top designed for Vessel Sink Application. Available with integral Stainless backsplash 4″-10″ in height. Provides a smooth continuous surface, eliminating any dirt-catching, hard to clean seams. All tops are mounted to a 3/4″ substrate and are ready for simple cabinet installation. Stainless Steel or Copper tops have a hand finished matte finish and optional integrated sink design – seamless one piece construction with customer’s choice of most any Stainless or Copper bathroom basin.